Fashion trends keep evolving. Each day, when you open a magazine, you are sure to discover something new in some part of the world. As you take inspiration for styling from magazines and lifestyle publications, there are custom fashion studios, like ours, where you can visit to transform your imagination into reality. With multitude trends catching your attention every day, you might feel perplexed about the best style of pleating or custom dyeing or tassels, and other design related elements. Let’s tackle the pleating aspect of design here. With pleated skirts and pants, pleated blouses and coats, this style serves well for everyone. But the key is that pleating isn’t restricted to just garments. The first thought of a model donning a pleated dress and walking down the ramp is sure to cross your mind, but let not your love for pleats stay cocooned. 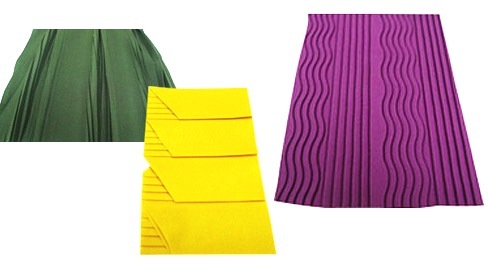 Pleating expands to larger fabrics like curtains, bed skirts, table cloths and skirts, hosiery covers, music instrument or television covers, and so on. With premade styles, many feel that they would end up buying the same pleated curtain in the same pattern, making their home look dull or similar to their neighbor’s. But the fact is that custom pleating can let you develop a garment or a home décor item that suits your personality and lets you be who you are. With machine embroidery, fabric dyeing, side pleating, crystal pleating, table pleating, and other custom patterns, you can stand out from the crowd. And we can help you do that effectively! Here, an interesting current fashion trend comes to mind. A general trend in pants these days is to wear skinny cuts. Not everyone can wear them comfortably and many wear them only because they have started believing that pleats are out of fashion and might never return. Pleats make the pants more comfortable and many body types crave for pleats. So, don’t throw away your pleated pants just yet. An important thing to keep in mind is that trends die and resurface quickly. The bell bottom pants from the retro era and the skinny jeans from not so long ago returned, and so will pleats. Also, there are still people who carry off pleated pants with confidence and enjoy comfort and style. Sometimes, it’s the perfect pleat that yields a neat, sharp look. After all, who’s to dictate what works best for you, but you! Carry off pleats like you own them and bring about a change in your look. Check out how you can embrace pleats here and here. For custom pleating, reach out to us now. What do you think about pleating as a fashion trend? What is your style statement? Share your thoughts below.